Do you pick your fabric and then let it inspire what pattern it should go with? Or do you choose your pattern then go hunting for the fabric you’ve already envisaged it must be made out of? More often than not, I’m the latter. And I specifically went shopping knowing I wanted to buy fabric to make a pair of Clovers. Problems begin fairly early on with this approach though because I’m forever seduced by potentially inappropriate fabrics. The seductive fabric in question is a duckegg twill coating – I spent forever in Tessuti umming and ah-ing over whether or not a wool coating fabric would be suitable, nay – practical – for a pair of pants. In the end, well – you know what happened. Wearing time will tell whether or not this was a smart decision! Because of the wool, I lined them with a white and navy blue polka dot silk. Who in their right mind doesn’t love polka dots? I’m a tad annoyed that the photos seem to emphasize things that don’t really come to light when looking at them in person, but hey, c’est la vie. very close fitting non-stretch pants! I’ve come to the conclusion that I need to relax a little when it comes to fitting patterns – especially pants. There’s this idea in my head that if I get a pattern to fit perfectly (a fairly subjective thing when we get down to the minute details), I’ll somehow manage to overcome what irks me about my body shape. Whilst a good fitting garment is going to be more flattering than a badly fitting one, accepting that there is no pattern that is going to make my legs appear longer/straighter/slimmer/whatever has been a quantum leap for me. My smoothest yet invisible-zip-to-seam transition! I also made a few little additions to the pattern – man style pockets at the front replacing the odd little coin pocket things that come with the pattern, and putting single welt pockets on the back. To do the front pockets I used the pattern pieces from Pattern Runway’s Sweet Shorts, which worked a treat. 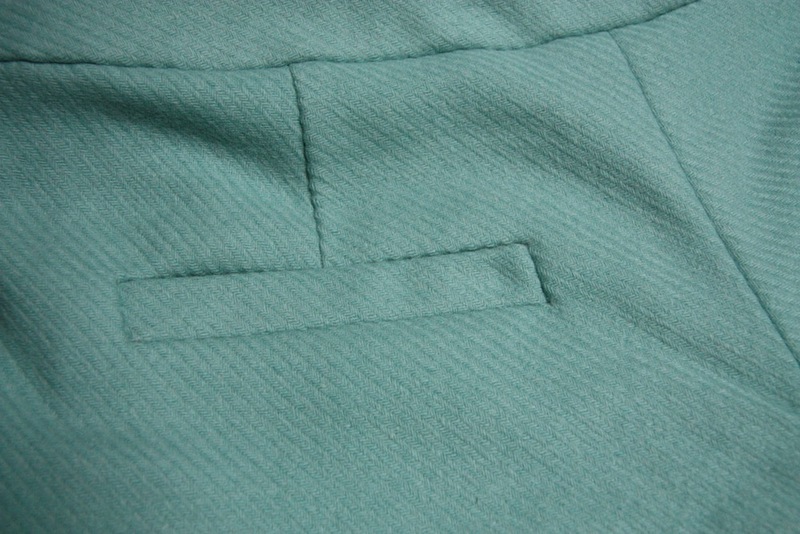 For the single welt pockets I used the same process as for my Sweet Shorts albeit adding in one extra step. For the pocket lining on my Sweet Shorts I used the same fabric as the rest of the shorts, so it didn’t matter if the welts sagged because you would only ever see the blue polka dot fabric. I didn’t want the lining fabric to show through on these though, so I needed to add a backing to the welt to keep the look homogeneous. As for the end result, I like them. Whilst the high-waisted pants look is something I’ll have to get used too, they are extremely comfortable. The original waist location of the Clovers was mid-way between my hips and waist which was horridly uncomfortable (I sat around in that toile iteration for a good half a day to convince myself of this), and reducing the rise back to hip level just looked wrong. Also, the man style pockets seem to be a great cheats way of getting a close fit with a non-stretch fabric, but still being able to sit comfortably because of the room for movement they allow. 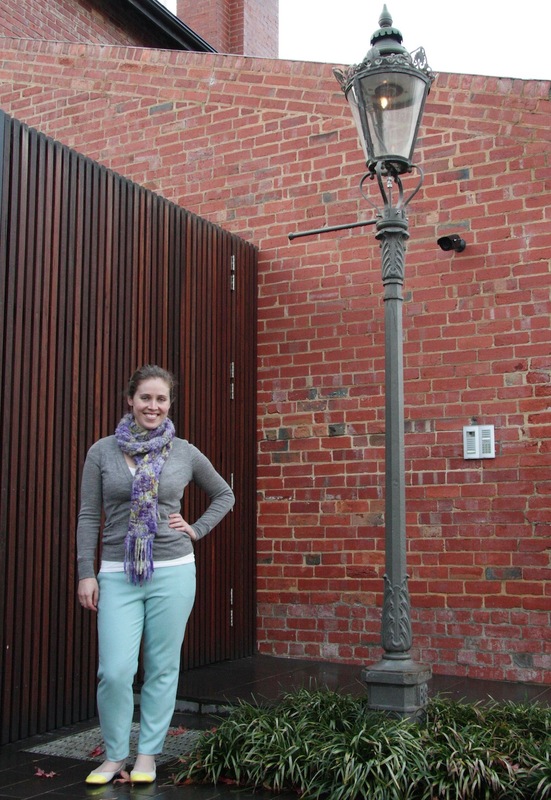 In the end what I really like about this pattern is that its so versatile – you can make them either dressy or casual. I do think it’s worth spending the time to get the fit right purely because the look is so timeless – I can definitely see myself making this pattern up again. I also seriously need to look at purchasing an overlocker. Colourful rayon seam binding does make me happy – but its such a black hole for sucking up all my sewing time! Oh yeah – I’ve also become a Pressinatrix. Do try it – the results speak for themselves. Cute! 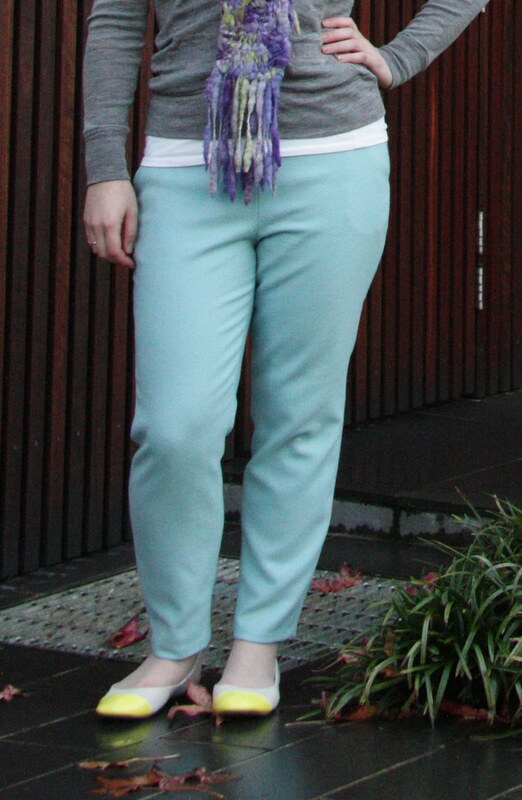 I love these pants – the color is pretty and the lining is awesome! Beautiful job on the details and they look great on you. Thanks for the reference to the Pressinatrix. I enjoy Gorgeous Fabric's blog, but had missed that one. Your persistence paid off. These look wonderful!! I hope they wear well. Lovely! I have the same hangups about fitting my body, especially with pants. These look like the fit wonderfully. Great work! Great pair of pants. Love the color. 4 muslins is definitely committed! Now you need another 3 pairs to make those muslins worth while…go on, pick some more fabrics! You have a great eye for detailing. These are great. THe binding and welt pockets are wonderful.I'm trying to slow sew as well but I get feel time pressured when I have the finishing details to do. Your details look fantastic, and so professional too! 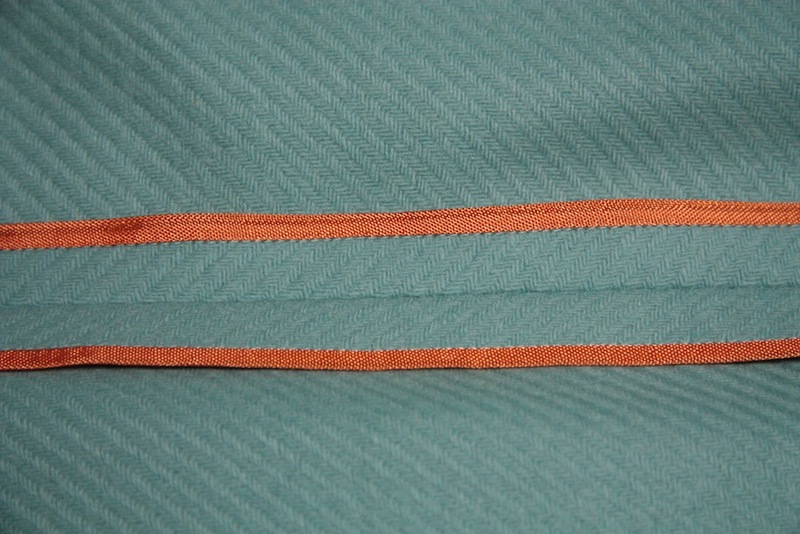 I love the pop of orange colour from the rayon seam binding and your welt pockets are perfectly executed. I'd be interested to know what you think of these pants made up in coating fabric after you've worn them for a while. They certainly look nice! Wow! Your garments are always gorgeous but these are particularly amazing. Will you make them again? In a stretch fabric? These are so beautiful. I love the colour and the fit is amazing. I'm really hoping the wool works out because these are so pretty. There's nothing wrong with slow sewing :) It's my forte lol. 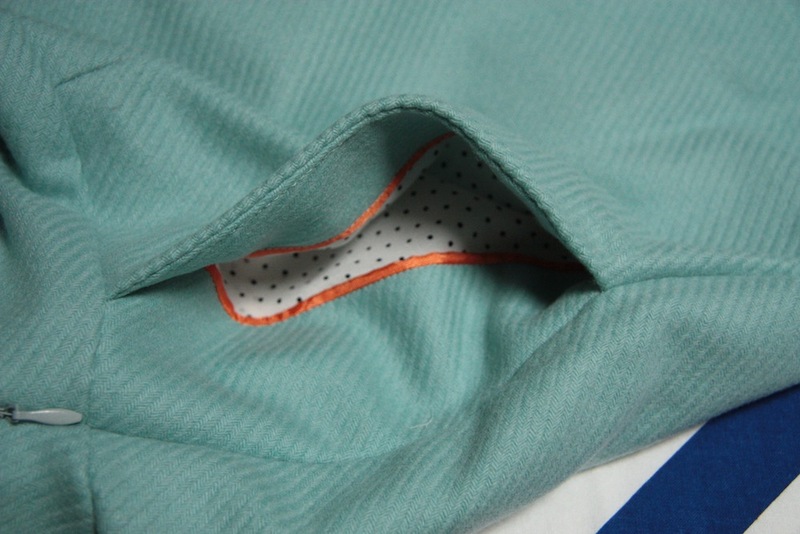 Love the orange seam binding!! They look great! I really love the color and the polka dot lining is so cute! I have to give you credit for making FOUR practice versions. I don't know if I would of had the patience. Such pretty clovers!! Yes the toiles are a pain in the backside, but the pants fit you great. I love the duckegg coating – it looks like it will make for a very sturdy, warm pair of pants and the color is just so beautiful. My favorite shade of blue/turquoise. 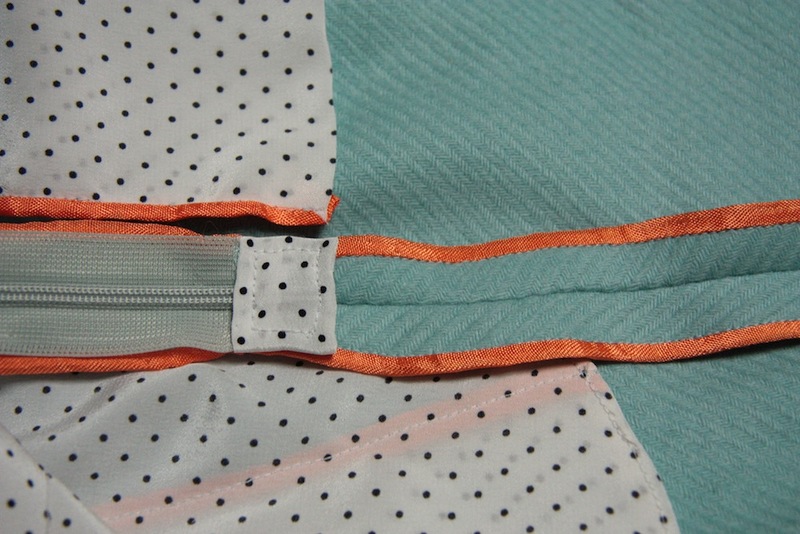 I'm seriously impressed with all your sweet little orange seam bindings and the zipper binding – I definitely believe in slow sewing, but I DO have a serger and am happy to use it – with much less pretty results, might I add! They really look beautifully made and a great fit – and I love these colours together too (this blue + that orange = one of my all time fave combos). 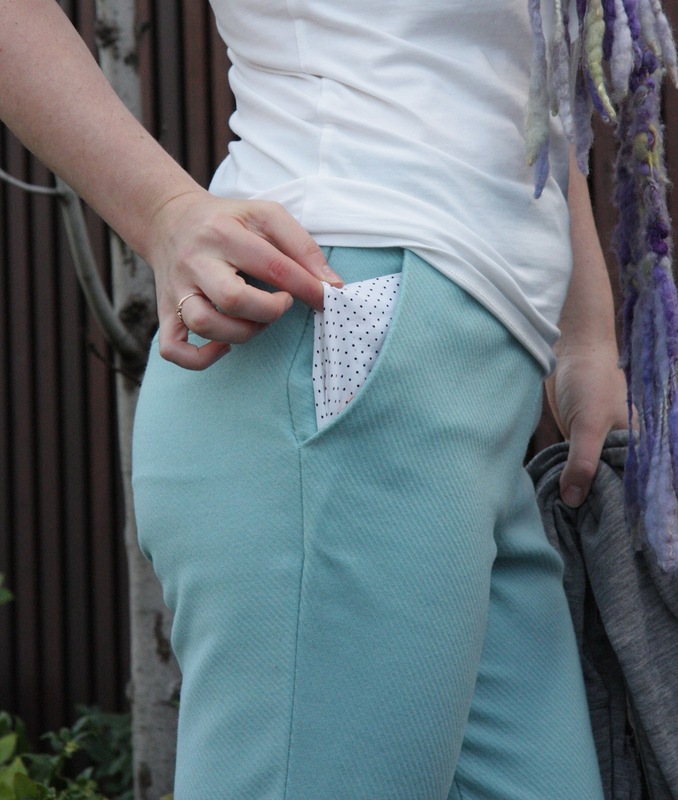 I don't know how you had the patience for several muslins and then on top of that to make the final pants so carefully…. but it is obviously worth it! I know nothing about sergers but would love one too – have to assume they make it quicker to finish something neatly! These are gorgeous! I love this color! Really beautiful! 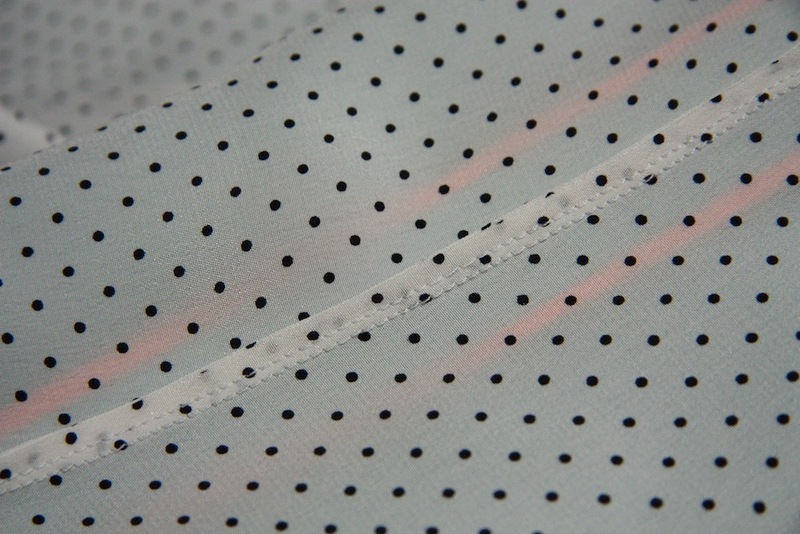 I like the seam binding, too– it's so time-consuming, but so pretty! LOVE the pants and all the fabulous details! The clash with the orange and the blue is so satisfying and the pants look like a fabulous fit. Well done again! Melanie, you've done another fantastic job bringing that fabric to life – I love the fact that you've chosen wool suiting for a pair of pants – suited to our Melbourne weather. Your attention to detail is perfect and you bring in colours so well. Slow sewing definitely if it brings these results. Congrats!! Yup, pressing properly make a world of difference to the final result. 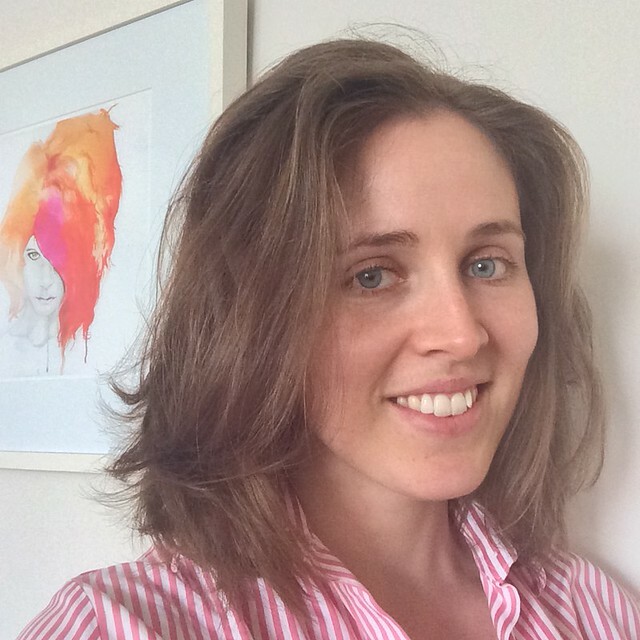 I'm a definite convert – thanks to Ann! Thanks Shams – they have been so far! hehe – definitely! Let there be Clovers! I do to. These sat around for a week complete all but for heming the legs. The little details at the business end of a sewing project are the hardest to get done I always find! Thankyou Karin! I'll be wearing them quite a bit as they're warm and its cold outside, so we'll see how they go! Absolutely. I ain't finished with this pattern yet. As soon as I come across a stretch fabric I like for these, you will be seeing another pair :) Thanks! Yay for Slow Sewing :) Thanks Zo! I'm super fussy :P Thanks Shanni! They are warm and lovely, for sure. Thanks Sallie – love your work! You go, Pressinatrix! Spread the gospel. Your results look great! 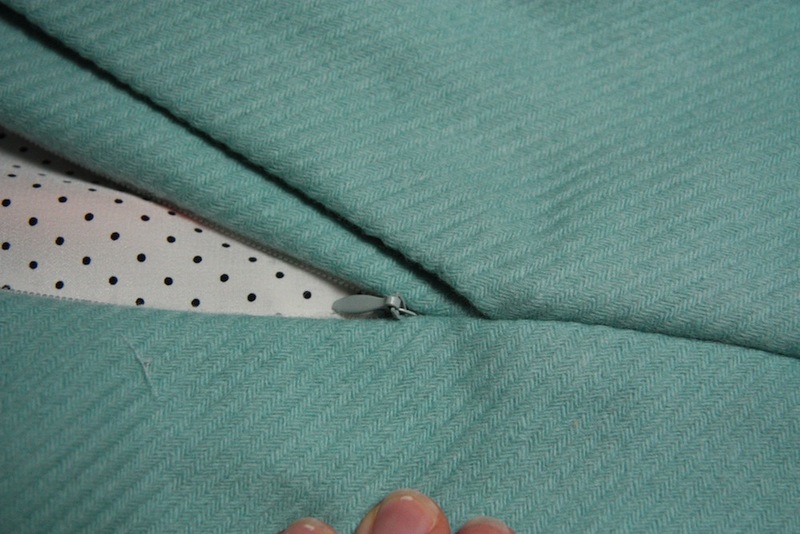 I'm going to toss my serger and do this with my seams from now on beautiful! Wow! These are so lovely! I love the orange binding and while I understand how much time this can take – the look is worth it. Wonderful job! These are really lovely. All your extra special details really take them up a few notches. I'm glad you included a close up of the fabric – so pretty. Ugh, I'm not a fan of making practice versions, but your hard work definitely paid off. Nice fit, excellent welt pockets, and very fun fabric choice. Nice pants! Sewing pants definitely intimidates the masses! You did so very nicely and I love the fabric you used. It's a great color on you:) BTW, I can't believe I didn't know you had a blog. As soon as I realized I instantly added you to my blogroll. Can't wait to see what other projects you get into (wink)! What a lovely job you did on these pants! Aqua is certainly your color!!! What a cute pair of Clovers!!! Beautiful work.